In 1884 Camille Pissarro moved with his family to Eragny-sur-Epte, a small village seventy-two kilometres north-west of Paris. He first rented, then bought his spacious house in 1892, living there for the rest of his life. Although he went to Paris to see his dealer Paul Durand-Ruel and travelled to Rouen, Dieppe and London in search of new painting motifs, Eragny became Pissarro’s Giverny, a reservoir of calm, of family life and of the renewing power of nature. He executed over 350 oils, gouaches and pastels of the area, many in the comparatively small compass of his own meadows, the adjacent smallholdings and lanes. Pissarro painted Eragny at different times of day, seasons and weather conditions, so that ‘by multiplying perspectives and viewpoints…. [he] produced an impression of remarkable diversity using motifs from an extremely narrow stretch of country’. Pissarro was just as skilful working in gouache as in oils, building up this composition using interwoven touches of colour, varying the strokes from staccato dabs to create the sense of sunlight filtering through leaves, to broader washes for the plaster wall of the cottage. Paysage avec trois paysans shows his wonderful control of tonal values and ability to evoke a season and time of day. Three peasants walk along a narrow path in the cool of a summer’s morning, the embowering trees casting deep, blue-green shadows, a gentle breeze rustling the treetops. The villagers are in complete harmony with the landscape which seems to protect them, their ancient dwelling nestling into the vegetation and taking a form which is almost organic. 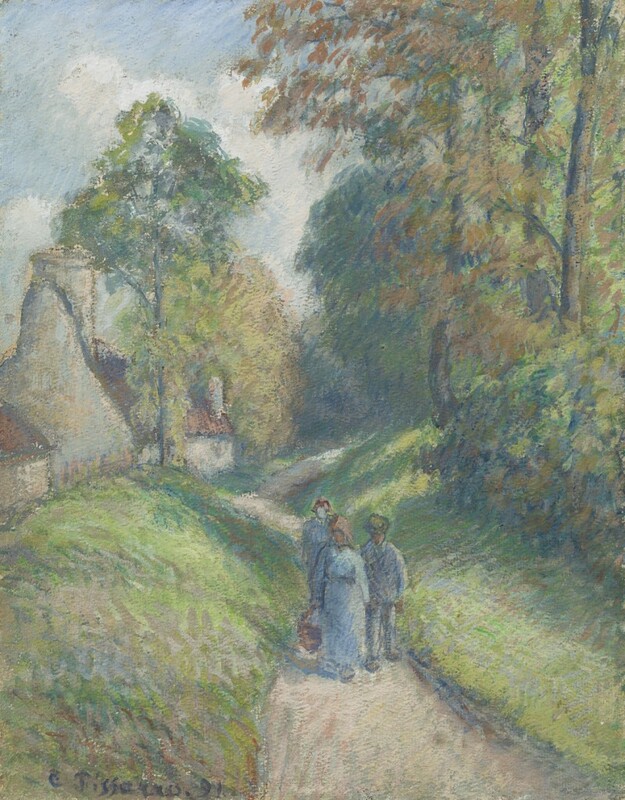 As an Anarchist, Pissarro believed in the value of labour and the hope that mankind would advance through sharing the bounty of the earth, rather than exploiting it. His peasants are dignified, yet unsentimentalized. In this gouache, Pissarro depicts an everyday event, but gives it monumentality. As Pissarro’s friend, the critic and novelist Octave Mirbeau, put it in a letter to the artist in 1891: ‘What breathes from your [work] is universal life, planetary life; in [its] reality there is always a splendid reaching out towards infinity’. Camille Pissarro was perhaps the greatest propagandist and the most constant member of the Impressionists and the only one to participate in all eight of their exhibitions. Born in 1830 in the Danish colony of St Thomas in the West Indies, of Sephardic Jewish parentage, he went to school in Paris and then worked in his father’s business for five years. Ill-suited to being a merchant, Pissarro decided to become a painter, studying at the Ecole des Beaux Arts and the informal Académie Suisse. He was considerably influenced and encouraged by Corot and to a lesser extent by Courbet. In 1885 Pissarro came into contact with Seurat and Signac and for a brief period experimented with Neo-Impressionism. The rigidity of this technique, however, proved too restrictive and he returned to the freedom and spontaneity of Impressionism. From 1893 Pissarro embarked upon a series of Parisian themes, such as the Gare St Lazare and the Grands Boulevards. He continued to spend the summers at Eragny, where he painted the landscape in his most poetic Impressionist idiom. Pissarro died in Paris in 1903. Pissarro and Durand-Ruel Snollaerts 2005, vol. III, op. cit., p.500. Quoted in ibid., vol. III, p.604.